It was a sisters-in-law day out for Kate Middleton and Meghan Markle at Wimbledon today, as the two appeared for their first ever solo outing together. 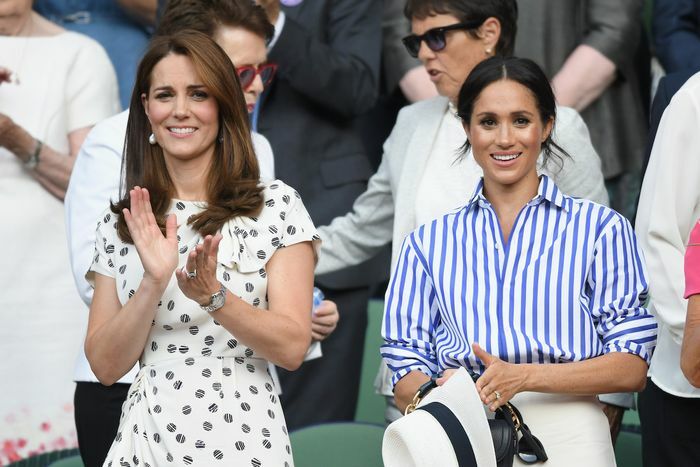 They attended Serena Williams’ match, as Markle is a close friend of the tennis star. Remember when Serena wore sneakers to Markle’s wedding to Prince Harry a couple months ago? For the occasion, Markle chose a super-preppy £69 Polo Ralph Lauren shirt and matching wide-leg trousers—the kind of look we haven’t seen from someone fashionable in the public eye for a while. Could MM be the new Jenna Lyons and reinvigorate preppy-cool yet again? It’s quite possible, considering the shirt has since sold out. Although it’s no surprise given the Duchess of Sussex’s power to sway retail sales. As for accessories, Markle chose some Illesteva sunglasses and a Maison Michel hat, which looks identical to the one she wore to Wimbledon back in 2016. Though still technically on maternity leave, Kate Middleton stepped out in a white printed Jenny Packham dress, a designer the Duchess of Cambridge has worn many times before. Scroll down to see their tennis looks. An occasion fit for royalty. Sold out, similar version here. Next up, see Princess Diana’s best Wimbledon looks.